At Sound Solutions Audiology, we respect the personal nature of hearing. As such, we offer demo hearing aids from four different hearing aid manufacturers, with customized fittings and programming. This ensures that your hearing aids are tailored to meet your specific hearing needs. From the time you are prescribed hearing aids, we work with you to ensure that everything fits properly and performs powerfully. In the course of your time as a hearing aid wearer, we continue to offer fittings and programming options to ensure that your hearing aids are functioning as they should to meet your hearing needs. As we monitor your hearing abilities, we will also make adjustments as necessary to your hearing aids. Sound Solutions Audiology offers comprehensive hearing exams to determine hearing ability and treatment. Hearing tests are simple and noninvasive, and provide your audiologist with the level and configuration of your hearing abilities. Prior to a hearing test, we ask that you gather your personal and family medical history, as well as to note the times and places in which you find you struggle with hearing. 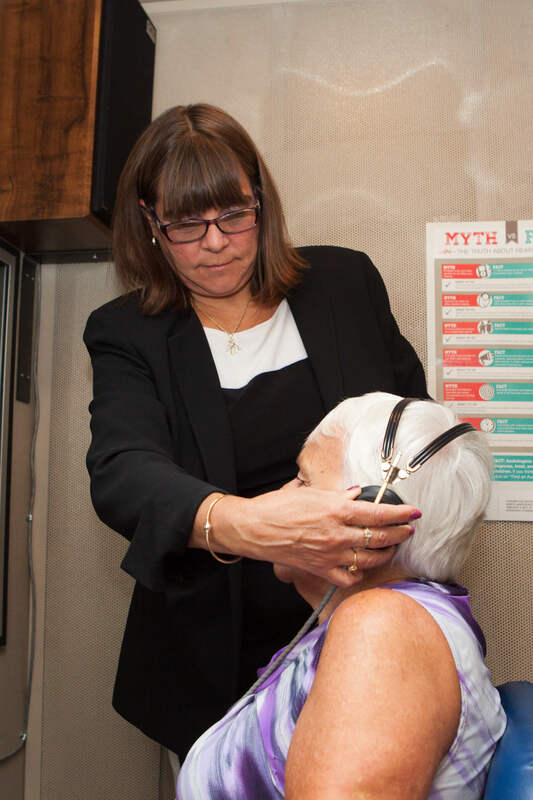 Your audiologist will perform a physical examination of your ears, and then give you a few tests that involve sounds and speech. Your results will be recorded in an audiogram, a visual representation of your hearing abilities by ear. From these results, we determine the next steps of treatment. Hearing aids are powerful electronic devices, durable to withstand daily wear. In the event that they are damaged or begin to malfunction, Sound Solutions Audiology offers hearing aid repair. When you first begin wearing your hearing aids, we will give you tips on everyday maintenance and troubleshooting guidance. Because hearing aids are almost mini-computers, it is important not to take them apart or tamper with the mechanisms. If the troubleshooting tips we’ve offered do not help, it may be time to take in your hearing aids for repair. We offer comprehensive repair for hearing aids. At Sound Solutions Audiology, we are seasoned professionals in treating hearing loss, but we also believe in the importance of protecting hearing while you’ve still got it. Custom hearing protection is molded to your ear and offers higher levels of protection from sound than silicon or foam ear plugs. We offer custom made hearing protection to meet your specific needs – whether you work in a noisy environment or your recreational activities (such as hunting or attending live concerts) expose you to dangerous levels of sound. For musicians (and music lovers), hearing is incredibly important. At the same time, exposure to high levels of sound, whether in a small dive bar or a huge stage venue, has the potential to permanently damage your hearing. Sound Solutions Audiology offers in-ear monitors and musicians’ ear plugs that provide protection from these dangerous decibels, to ensure that your hearing is protected while you’re doing what you love. Whether you wear a hearing aid or not, there are times where you may need an extra boost in sound. Assistive listening devices (ALDs) are designed to amplify the sounds you want to hear and deliver them to a personal neck or ear piece that you wear. ALDs come in many options, with FM waves or infrared light waves to transmit sounds. These are useful in large venues, such as auditoriums or conventional halls, or in noisy places such as a restaurant. Some ALDs may stream directly to your hearing aids. There are also ALDs available for phone calls, with the option to have live, real-time captions on your calls. If you find you need extra amplification, ask us about our line of ALDs at Sound Solutions Audiology.